It takes a set of all-around skills to maintain the electrical efficiency and safety of your home. While there are some repair and item prospecting aspects which you can do on your own, there would also be crucial instances where the service of a professional is much more necessary. This is why aside from practicing your repair skills, you’ll also need to have an expert electrician on stand-by for jobs which require more electrical proficiency. At times, we all need a reality check when it comes to seeing which types of jobs are best meant for professionals to take care of. There really are DIY projects which can be harmful when done on our own. It’s important to have a scrutinizing eye to identify the projects which pros must handle. The ultimate goal of every respectable prepper is to get off the grid completely and live a free, happy and fulfilling life, enjoying nature and the abundance offered by nature, without being dependent upon government agencies for survival. There’s a tiny little problem with this utopia: energy. If you’re accustomed with 21’st century every-day conveniences, like reading this article from your computer over the internet, you already know what I’m talking about. Until we discover a cheap and easy way of producing free and endless energy, we’ll never be free to do whatever we like with our lives. You probably already know about the Solyndra scandal and the epic fail of generating electricity in a big way using tons of solar panels and heavy subsidies from taxpayers money. However, photovoltaic panels are actually an excellent alternative for producing small amounts of energy in a decentralized system (like your home or your place of business) as opposed to using them on a massive scale.. Solar power generation has its limitations and if you’re a power-hungry household you should look elsewhere. Obviously, for the project to succeed you must live in a “sunshine state” or area and also you should be able to afford buying the photovoltaic panels (B-grade types are cheaper and just as good), the batteries, the controllers, inverters and the rest of the gear. The best thing about this project is that it will cost you almost one third if you compare it with commercial versions (which cost ~$400 and don’t include photovoltaic panels!) and it works just as well. The parts required for the assembly are available online on amazon.com and you can build it according to your own needs and specs, i.e. as big and as heavy as you like it or need it. I think I already told you about the endlessly cool applications involving five gallon plastic buckets and I mentioned this idea about a power generator in a recent article. However, you must remember that the plastic bucket serves just as the box, the recipient for the actual power generator. It’s just the shell, the casing, the chassis. You got the idea, right? 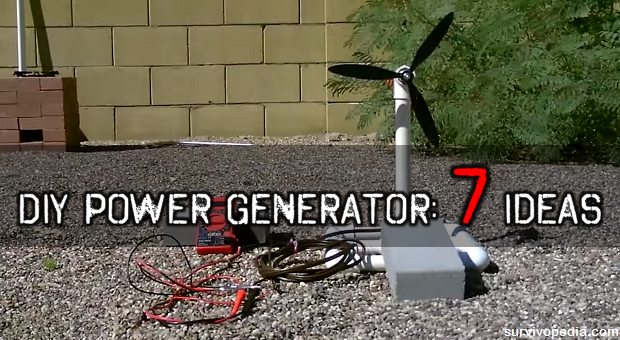 Basically, this five gallon plastic bucket power generator was invented and patented by a great guy named Sam Redfield and it’s relatively easy to build if you’re following the steps and materials detailed in here. This is an experimental power generator aimed for helping people living in third world countries in which energy is scarce. It requires a steady flow of water, i.e. 26 gallons per minute. It’s essentially a pico-hydro system (meaning tiny). The idea behind using a lawnmower for generating power is pretty straight forward. It’s like a regular power generator; you know, the ones running on diesel or gasoline engines? Well, the concept is just the same, but instead of a regular power gen unit, you’ll be using your good old lawn mower as the hamster running on the wheels for generating power. This is a relatively easy DIY project if you’re familiar with electrical components and engines. Also you can save lots of $ by cruising recycling centers and junkyards to pick up the required parts. The concept is to use a flowing stream of water as the power source for the “turbine” and the internal components of the washing machine as hardware for the generator + a battery and an inverter. It’s an excellent project for generating free electricity from scrap, but you’ll need a bit of skill and hard work (with almost zero investments except elbow grease!). This is by far my favorite DIY power generating project and the most efficient and reliable in terms of “best bang for the buck”. Below there’s a video with the tutorial but keep in mind that power generating using your muscles is not a “solution” for living off grid. I would regard it as an “exercise” for the real thing, like training for real combat with rubber knives and that sort of thing. The idea is nothing new; it was used (and still is in use) by “serious” companies all around the world for generating energy using wind power, but the end results are, at the very least debatable. Here’s a video depicting the process of DIYing a small wind power generator for running a radio or charging your phone. You’ll need a combination of practical know-how, and being wise enough to know when the services of a professional electrician would be more helpful. Another aspect of the home which you might want to be more aware about would be the generator. Setting your targets and expectations on the unit you can have installed should give you the practical mindset towards wisely choosing your electrical backup. A gas-powered home backup generator works like a normal backup generator. If there’s a power outage, the generator turns on automatically and delivers backup power to your property – all within just seconds. Plus, because it happens automatically, you don’t have to be there to flip the switch. So your appliances, such as fridge/freezers, will keep running even if you’re not at home. The difference is that this generator is connected to your existing natural mains gas supply. So there’s no need to keep petrol or diesel fuel on hand or worry about whether the fuel will run out. You also have the option of running the generator from a bottled LP gas supply – however this is less popular than using mains gas, as it is less convenient and can be more costly. It depends on the generator. In the Australian market, the leaders for gas generators for home backup or small business backup are Generac. Their auto-start gas-powered generators range from 8 kVA to 13 kVA. For most standard homes, 8 kVA to 13 kVA is a suitable size; it will keep your critical hard-wired systems running such as security systems and will run all your essentials throughout the home, e.g. your lights, fridges, freezer, computer, television, fans, kitchen appliances etc. When you start adding larger wattage appliances on top (e.g. Washing Machines, Dryers, Air Conditioners etc. ), then you may need a larger unit. Again, 8 to 13kVA will work for most homes, but it depends on your particular home and the appliances. Some larger appliances like central air-con and heating units may need to be assessed on a case by case basis. We recommend you engage a qualified electrician to undertake a power reading on your home / small business premises to find out what size generator you need. Gas-powered generators have to be installed by a qualified electrician and plumber, as certain building regulations must be met; A licensed plumber for the installation/sign-off, and an electrician for the Transfer Switch. A professional will be able to work out the logistics of installing a standby generator in your home and connecting to the gas line. We can recommend a professional installer in your local area, so please call us if you would like help in that regard; 1300 400 122. 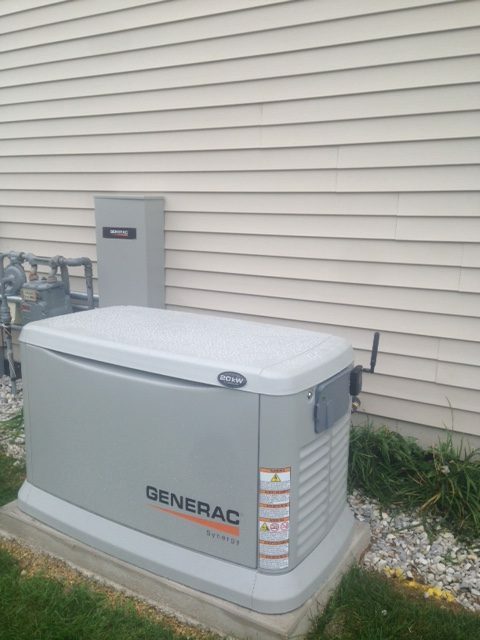 A gas-powered backup generator is installed outside, like your central air conditioner unit. The transfer switch is located next to the main breaker box. But don’t worry, even though it’s outside, you won’t have to worry about braving the elements to switch anything on or off; in the case of the Generac range; it all happens automatically. Generally, no. Most domestic standby generators are designed for home use, which means the noise level is very muffled. For example, the Generac range emits only 60 db(A) at normal operating load; this is about the same as an idling car or air conditioning unit. That depends on your power needs, budget and other factors. Diesel and Petrol backup generator units are still very popular; particularly for people who aren’t on mains gas. But if you have access to mains gas, then Auto-Start Gas Powered Generators are a very compelling proposition; once you have one professionally installed, you can set and forget, knowing that backup power to your home will always be there – instantly! You’ll need a professional to install your chosen generator in your home. This way, all components of your circuitry may be considered and examined, so you could make the most of your unit’s capacity. These ideas and being well-aware of some DIY practices should enable you to maintain your house for the better. Consequently, it’s always a must for you to also have an electrician to handle more thorough functions of your property. Fail Safe Electric Company is composed of expert technicians who ensure the highest quality of electrical services may be rendered to every property in Chicago. Their core of working values also ensure every project they carry out will be done with efficiency and professionalism.